You might think that you're up a creek without a paddle if you've forgotten your fishing pole and gear during your outdoor adventure. However, with the right materials, you'll be able to fashion a pretty awesome and super efficient fishing pole out of just a power drill and fishing line! Believe it or not, the guy on the video was able to do just that, and he can demonstrate just how easy it is! So when SHTF, you'll still be able to survive and thrive. 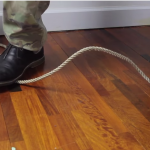 Just wait until you see how easy it is to make this power drill fishing pole. You'll never go hungry again! 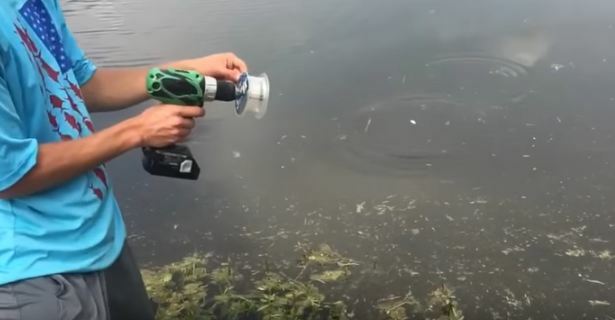 Watch and see how one guy can fish using a power drill on the next page! Now that I know how he uses this fun trick to fish, I can't wait to try it! (Video) Prepper Uses Cutters to Split Barbed Wire… This Hack and Many Others Will be Very Handy During a Catastrophe! Yes, because when I go fishing i make sure to have my cordless drill . but not my rod and reel….seriously how is this even a post? How many fish lips did you tear apart before you landed one without setting the hook? And if you had an power outlet adapter, parked your vehicle next to the water and used an old house fan. Just cut the blades off, tape on some fishing string so it can’t slip off. Rap it up and then throw out the slack after you put a hook and bait on it. Then you can turn the fan on and real in fish too when they bite. Nothing prepares me for some light carpentry like a fishing trip. Because I always bring a cordless drill with me when I fish. WTF? Really?